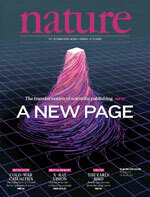 Nature magazine published a special issue “The future of publishing: a new page” 27 March 2013. The next day, Cameron Neylon published a Comment, “Let’s get this straight: Open-access terminology needs to be employed accurately“), in Times Higher Education. John Wilbanks, Open Access advocate formerly at the Science Commons project of Creative Commons, now at Sage Bionetworks. Based in Washington, D.C.
Jason Hoyt: co-founder, Mendeley, currently co-founder at PeerJ, London. Matthew Cockerill – Co-founder, BioMed Central, now at Springer BioMed Central, London. David Mainwaring – Commissioning Editor, SAGE Publications, London. (specialty in International Relations). Martin Paul Eve – lecturer, University of Lincoln; co-founder, Open Library of Humanities. Cameron Neylon – Advocacy Director for PLOS (Public Library of Science). Based in Bath, UK. Jan Velterop – founding director of BioMed Central, BOAI (Budapest) signatory, CEO Academic Concept Knowledge Limited (AQnowledge). Peter Murray-Rust – Professor of Chemistry, Cambridge. My quarrel is with the publishing industry’s attempt to write a new license [i.e. “CC Plus“] and I have no wish to lump those with whom I have a philosophical disagreement with those OA advocates who sincerely dislike CC BY, like Heather Morrison or many in humanities, into the same pool. @jasonHoyt @bmcmatt “@Wilbanks re. ill-informed criticism of CC-BY http://t.co/HauPzLclts”: can we engage strongest, not specious args?
. @creativecommons @wilbanks @NatureMagazine OA will work only if there is consent, rather than the imposition of a particular definition. @d_mainwaring @creativecommons @wilbanks @NatureMagazine but consent has to be informed consent – much knee-jerk to FUD currently. Eve has elsewhere advocated the use of CC-BY licenses for Open Access humanities scholarship, which is the focus of the Open Library of Humanities project. @wilbanks @jasonHoyt @bmcmatt is there, or might we make, an args page, distill & enumerate & anchorlink all key arguments & rebuttals? The next day, Cameron Neylon’s piece “Let’s get this straight: Open-access terminology needs to be employed accurately” was published in Times Higher Education. @CameronNeylon “get OA terminology right”: what are your thoughts on how to use/define “Open Access” itself, per @wilbanks’ comment e.g.? @tmccormick @CameronNeylon the BBB declarations don't do it for you? that's all this is about to me, not CC BY. @wilbanks @CameronNeylon I’m not sure that asserting a single yes/no definition of #OpenAccess is necessary, or always helpful. @tmccormick @CameronNeylon then we have a fundamental disagreement. definitions=vital to ensure open source means something. same here. @tmccormick @CameronNeylon i would rather you say "we won't meet the BOAI" than try to pervert the term open access. much more honest. @tmccormick @CameronNeylon remember: Raymond coined a new term, not Stallman. OA=defined. Don't like? Define a new term, try to get uptake. @tmccormick @CameronNeylon it's perfectly fine to not meet BOAI. valid reasons for it, especially in humanities. but don't call outcome OA. @wilbanks I’d ask, what are costs & benefits of such an approach, is it necessary? OA isn’t trademark, predates BOAI, right, so why owned? @tmccormick there is a serious benefit to a community-driven definition. just like the 4 freedoms of free software. @tmccormick i'm not being snarky. i think there is room for a new term for the broader universe of public access, which is the term i'd use. @tmccormick i don't understand why the burden is on those who agree with BBB to change the term. coin a term, market it. we did. it works. @tmccormick but since OA actually means something, preserving its meaning *matters* to many, many, many people.
.@CameronNeylon @petermurrayrust OA broad use: Finch/RCUK/HEFCE Wikipedia @JohnWillinsky @petersuber etc. Isn't common cause beneficial? Finch is the Finch Report delivered and accepted by UK government in 2012, endorsing open access as public policy. RCUK and HEFCE are the primary UK public research funding bodies. John Willinsky is founder and Principle Investigator at the Public Knowledge Project, Professor of Education at Stanford, and author of The Access Principle. Peter Suber is Director of the Harvard Open Access Project, Faculty Fellow at the Berkman Center for Internet & Society, Senior Researcher at SPARC, Open Access Project Director at Public Knowledge, and Research Professor of Philosophy at Earlham College; and author of Open Access (MIT Press, 2012). @CameronNeylon it's a valid def. of #OA; my Q. is, why fight that battle vs. common usage & wider allies? isn't broadening access the point? After this exchange, I wrote a comment to the Times Higher Education article by Neylon. Besides the terms “Gold” and “Green” being misused, the term “Open Access” (or “open access”) itself is a battleground between factions as well. Differing visions of future publishing, and differing strategies of how to progress, both play out upon it. For example, John Wilbanks’ article in the current special issue of Nature (“The future of publishing”) argues that “for an article to be considered truely open access, it has to meet the…definition in the Budapest Open Access Initiative,” preferably expressed by the CC-BY license. (http://www.nature.com/nature/journal/v495/n7442/full/495440a.html). However, “Open Access” is being pervasively applied to practices which don’t meet the BBB (Budapest, Berlin, & Bethesda declaration) definitions — e.g. embargoes, NC or ND license restrictions. Is this allowing the pollution and undermining of the movement, or is it reasonable accommodation to circumstances, and steps towards the longterm goal — bringing various communities together in common cause, around a more capacious understanding of the principle? In political terms, is there more need for Big Tent, or message descipline? If positions on this aren’t well-considered, it can lead to similar problems as misuse of “Green” and “Gold”: language getting in the way of issues, sound and fury, people talking past each other, distrust and distraction. While the great ocean of opportunity lies mostly undiscovered before us. @tmccormick @CameronNeylon Absolutely, but see compromises for what they are. Legitimate, necessary, but compromises nonetheless; not #OA. @tmccormick Otherwise we risk losing momentum when only halfway along journey. Wider access gd, public access great, #OA the ultimate goal. @tmccormick I would agree fighting not useful, I just prefer careful use of words and quiet explanation of those choices. @CameronNeylon right, think it's a classic pattern – q. of movement purity/discipline vs. coalition/accommodation. @tmccormick @CameronNeylon Of course, #OA is a means to a goal, not a goal in itself. But fuzzifying OA is not the way to make that clear. @CameronNeylon @tmccormick agreed. As opposed to "we will dissemble, drag heels and muddy the water to maximise out hold on the past"
Cameron Neylon has written a compelling article and why we should get rid of “Green” “Gold” “Open Access” as meaningful labels. Because they no longer mean anything. They are as useful as “healthy” in a burger advertisement. I’m not going to repeat Cameron’s arguments – just read them yourself and redistribute. “This article is CC-BY”. Revere the authors. They want you to acknowledge them and use the article or bits of it for anything anywhere for any legal purpose and they rejoice in people making money out of it without their explicit permission because the more this happens the prouder they feel and the more others value them. So maybe we need a joyous declaration on scholarly papers. After all Open Access is good and wonderful. A; Open access means people can live and make a better planet. Not-A: Closed access means people die. A OR not-A ? In my next post, I plan to expand on my suggestion of working together to articulate and relate positions / counter-arguments in one place. This approach might be called “Collaborative Advocacy“: try to bring together advocates who don’t necessarily agree, and collaborate for optimally engaged, evidenced, clarified expressions of their respective positions. The topic in this case is Open Access, but obviously the approach might be tried for any number of other issues. Possibly, such a forum/argumentation design could encourage credibility being based on clear, easily-accessible and verified evidence of deep, good-will engagement with counter-argument and diverse views. Which is, you know, not always what happens in the rich human tapestry of discussion. And which would be, arguably, a format expressing in situ the structure which the scholarly or scientific worlds purport to have as a whole. This has some potential advantages not only for audiences, but for advocates themselves, who often have to continually restate nearly the same arguments in many forums, with comparatively little time to fine-tune or correct their statements. This way, they can get arguments as right as possible, and then just refer people to them by number — like an old couple who know each others’ jokes so well they can just refer to them by number and make each other laugh. In scholarly publishing terms, this is something like the contrast between the “article”, or individual exposition model, vs. the “topic page” as represented by Wikipedia and scholarly reference works. Except it would not be single point of view, and particular arguments would be attributable to particular contributors. (possibly close to a Wikipedia-style overview page that has broken a topic/issue into sub-, variant, and conflicting views with their own pages). @bmcmatt @HughRundle “@Wilbanks on ill-informed criticism of CC-BY: ill-informed criticism is everywhere; why not respond to well-informed? @tmccormick @bmcmatt @HughRundle i think you answered your own question. "it's everywhere" is a good reason to focus on ill-informed. @wilbanks yes, good to treat ill communication. Also, to try to understand & engage all/best args – reaches more people, I think. @tmccormick i only got 1000 words! not the place to treat "all" arguments. @wilbanks yes, I know. I'm not just talking about the Nature article. @tmccormick i've spent enormous amounts of time promoting non-BOAI compliant approaches. i just don't call them OA, because they're not. @wilbanks @tmccormick Quite! There are legitimate, needed, compromises, but calling them #openaccess has sown more confusion than necessary. @Villavelius @wilbanks what you see as confusion may to others seem evolution, broadening, coalition, bigger impact. @tmccormick this isn't about BY. it's about what open access means. please just call what you're doing public access. @tmccormick the free software / open source software distinction is good for software. far better than trying to dilute what "Free" means. @tmccormick i think the green/gold divide was a bad mistake focused on methods. i prefer open/public focused on rights. @tmccormick @Villavelius there *is* a conversation. i am trying to *change* its tone from gold/green to open/public. @tmccormick @Villavelius i would strongly encourage you to look into the negative impacts of license proliferation in open source. @tmccormick @Villavelius license proliferation was a significant net negative against the emergence of open source software. @wilbanks to me the conversational approaches of, e.g. Peter Suber & John Willinsky seem effective. @tmccormick and i love them, too. but they're not me, and i choose an advocacy, change-driven approach. @tmccormick and to be clear, i love public access. i fight for it. we need both PA and OA, because one size doesn't fit all. @wilbanks sure, love to anytime. They say civilization begins with beer, right? next time you're in SF perhaps.